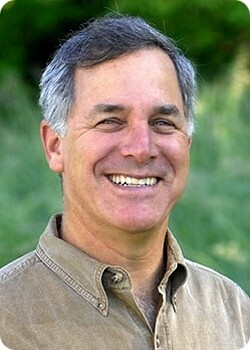 Gary Hirshberg is the husband of writer Meg Hirshberg and the father of three yogurt eaters. He is Chairman of Stonyfield Farm, the world’s leading organic yogurt producer, and the author of Stirring It Up: How to Make Money and Save the World (Hyperion, 2008). Gary frequently speaks on topics including sustainability, organic agriculture and the profitability of green business. Gary has overseen Stonyfield’s growth, from its 1983 infancy as a seven-cow organic farming school to its current $360 million in annual sales. Stonyfield has enjoyed a compounded annual growth rate of over 23% over 21 years, by consistently producing superior products and using innovative marketing that blends the company’s social, environmental, and financial missions. Stonyfield partnered with Danone in 2001, and Gary is now Managing Director of Stonyfield Europe, with organic brands in Ireland, and France. Gary serves on several corporate and non-profit boards including Applegate Farms, Honest Tea, Peak Organic Brewing, Late July, The Full Yield, SweetGreen, RAMp Sports, Glenisk, the Danone Communities Fund and the Danone Livelihoods Fund. He is the Chairman, CEO and Co-founder of Chelsea’s Table Cafés, a natural and organic fast casual restaurant firm. In 2011, President Obama appointed Gary to serve on the Advisory Committee for Trade Policy and Negotiations. He is a Co-Chair of AGree, an agricultural policy initiative formed by the Ford, Gates, Kellogg, Rockefeller, Walton and other leading foundations. He is Chairman and a founding Partner of Just Label It, We Have the Right to Know, the national campaign to label genetically engineered foods, and is co-author of Label It Now – What You Need to Know About Genetically Engineered Foods (New Word City, 2012). All proceeds from the E-book benefit Just Label It. Gary has received nine honorary doctorates and numerous awards for corporate and environmental leadership including a 2012 Lifetime Achievement Award by the US EPA. He was named a Yale Gordon Grand Fellow, one of “America’s Most Promising Social Entrepreneurs” by Business Week and one of the top ten, “most inspiring people in sustainable food.” by Fast Company. Gary was featured in the successful 2009 documentary “Food, Inc.” And you can see him on YouTube in the “Just Eat Organic” Rap Video he wrote and performed. Stonyfield has garnered several prestigious awards over the past few years including EPA Clean Air Excellence (2009), “Business of the Decade – Manufacturing & Technology” (Business NH Magazine), “2010 Top 10 Leaders of Change Award” (The Foundation for Social Change and UN Office for Partnerships), “One of the Five Best Large Companies to Work for in New Hampshire” (Business NH Magazine & NH Businesses for Social Responsibility, 2010 -11), “Best Environmentally Friendly/’Green’ Business (New Hampshire Business Review, 2011), and the Institute of Packaging Professionals AmeriStar Award for Stonyfield’s Plant-based Yogurt Cup (2011). Previously, he was the Founder of Climate Counts, Director of the Rural Education Center, the small organic farming school from which Stonyfield was spawned and Executive Director of The New Alchemy Institute – a research and education center dedicated to organic farming, aquaculture, and renewable energy. Before that he was a water-pumping windmill specialist and an environmental education director with the US Fish and Wildlife Service. He also authored books on wind-power and organic gardening. JLI is a national coalition of more than 600 diverse groups and 300,000 members dedicated to the mandatory labeling of genetically engineered foods. The Just Label It message is simple: consumers have a right to know about our food so we can make informed choices about what we buy, eat and feed our families. Japan, Russia, China and the member nations of the European Union are among the 50 nations worldwide that require GE foods to be labeled. In the European Union, these foods are not only required to be labeled, but they also are banned from being cultivated with only minor exceptions. Instead of labeling, the U.S. has a “fast track” approval process in place for new GE food products. Studies show labeling foods containing GE ingredients is supported by an overwhelming majority of Americans — more than nine out of ten voters (91%) across all demographics, including political parties, gender, age, and socio-economic status. Yet for 20 years, Americans have been denied that right. While our reasons for wanting to know about our food may vary, what unifies us is the belief that this is our right. Without labeling of GE foods, we cannot make informed choices about the food we eat and feed our families. As the FDA petition for GE foods labeling states, “in America, we pride ourselves on having choices and making informed decisions.” JLI is committed to fight for this right. Launched in the fall of 2011, JLI’s coalition includes more than 600 partner organizations representing the healthcare community, consumer advocates, farmers, concerned parents, environmentalists, food and farming organizations, businesses, the faith-based community, and many more concerned with protecting the consumer’s right to know. Mounting support for the right to know has led to JLI’s unprecedented success. It took only 180 days for more than 1.2 million comments to be generated on the FDA GE foods labeling petition, the most comments on a food petition in FDA history. In addition, in just five days JLI generate 25,000 GE labeling signatures on the White House “We The People” on-line petition. Support for mandatory labeling continues to grow. California has put GE foods labeling on the statewide ballot for November, and 18 other states have GE foods labeling efforts underway. While the pros and cons of GE foods are debated, too many of us are being kept in the dark and are unknowingly eating GE foods daily. Washington can no longer ignore the voices of millions of Americans who want choice and peace of mind about their food. It is time for the FDA to update its practices to the 21st Century, and mandate federal GE food labeling. JLI will continue to keep the pressure on Washington until we have the right to know about our food. To sign the petition and earn more about the right to know, visit JLI on the web at www.justlabelit.org.